As fanSHEN’s creative director Rachel Briscoe commented in a blog for The Guardian, “starting points matter in theatre”. Unlike others, who may interrogate the damage done by our resource-hungry society through content and even form but leave the structures that support them unexamined, sustainability is at the very foundation of fanSHEN’s work. 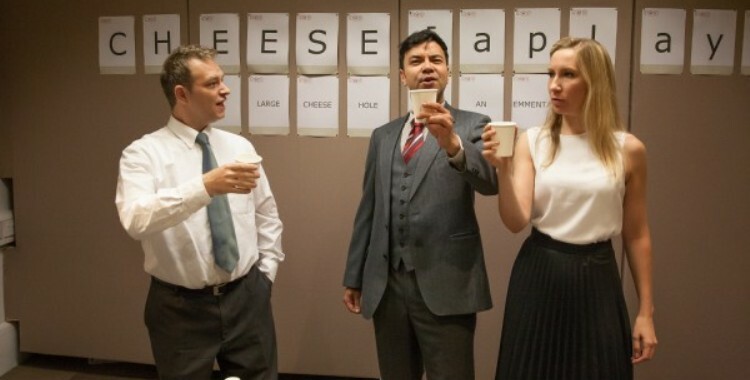 However powerfully it delivers its punch, it’s hard not to watch a technically accomplished show like Earthquakes in London and wonder cynically where the energy is coming from; in the case of Cheese, fanSHEN’s new site-specific look at the financial crisis, there’s no need to wonder. Every last element of this production is influenced by its relationship to the company’s sustainability aims. Joshua Pharo’s unusual but striking lighting design is a necessity of limited energy, all of which is provided by electricity generated in local gyms and community centres; the DIY aesthetic and unmasked theatricality are a consequence of constraints set by the company on the materials it uses. Because these limitations are there from the beginning, embedded right in the heart of the company’s philosophy, they end up closely married to the work. As well as practising what they preach, fanSHEN’s dedication to sustainability is reflected off every facet of their work, both informing and supporting it. This is theatre that recognises its role in making as well as showing, enacting at the same time as it represents. Unfortunately, however, the different strands of the show itself do not gel quite as cohesively. Nikki Schreiber’s play adopts an absurdist approach in order to take a sideways look at the financial crisis, creating an allegory that substitutes cash with cheese. Protagonists Joe and Freya seem pretty cosy in their Emmental house, but when their supply of cheddar, brie and gruyere suddenly dries up overnight, they are forced to reassess their existence – and their diet. Freya is quick to pursue a new life, while Joe stubbornly clings to the vestiges of the old one until disillusionment and hunger send him on a journey in search of fresh flavours. The central story of Joe and Freya’s rise and fall is a cannily plotted exploration of the predicament we now find ourselves in, using a metaphor that functions both as a lucid explanation of the financial crisis and a means of highlighting the absurdity of the actions that caused it. The surrounding narrative, however, is not so tight. Joe’s journey, despite offering a series of entertaining encounters, takes a decidedly meandering route. At one point, for instance, he finds himself talked into participating in a psychological experiment, the outcome of which offers a telling and unsettling diagnosis of our response to perceived authority. While this sequence is sharp, disturbing and theatrically compelling, however, it serves as a distracting digression from the main trajectory of the piece, addressing a question that is fascinating but tangential. The play proper is also framed by another reality, which is where the site-specific element of the piece comes in. The fictional setting of this very ordinary office space on Oxford Street is the London Mortgage Company, which is having its last post-liquidation hurrah by putting on this deeply apt bit of theatre for its departing employees. This device acts as an explanation for the potentially temperamental power – the company haven’t been able to pay their electricity bill – and for the deliberately shoddy props. With simple and often hilarious flourishes of ingenuity, elastic bands become pieces of cheese and bulldog clips stand in for tomatoes. This framing is the source of much of the piece’s humour, as the cast get to relish in some of the worst excesses of am-dram and theatrical tricks are stripped back to their bare basics. But Rachel Donovan, Jon Foster and Jamie Zubairi are all far too good to consistently convince as awkward novice thesps, while the truly beautiful theatrical moments that emerge from the enforced simplicity are undermined by the implicit mockery. The relationship between frame and image also feels regrettably underexamined. Why are the employees choosing to put on this play? Are they aware of its shattering resonance with their own predicament? The dissolving layers of meaning would seem to suggest so, as distress and anxiety bleed both ways, but the interaction between the two concepts demands further scrutiny. Despite these criticisms, however, there is much that the piece offers by way of obliquely insightful political comment. The impulses that invisibly motor our society are unveiled through the distance offered by metaphor, while the possibility of resolution is complicated by an astute critique of localism and a recognition of our continuing desire to protect our own interests first and foremost. But there is still hope. Alongside sustainability, central to fanSHEN’s work is a belief that imagination, not fear, is the pathway to change. So, despite the underpinning of self-interest and the ambivalent attitude towards the wider world, we are ultimately offered a chink of much needed optimism. This too is inherent in the very mechanisms of the work, which makes its own change. If fanSHEN can shift the way in which their structures operate, then why can’t we?